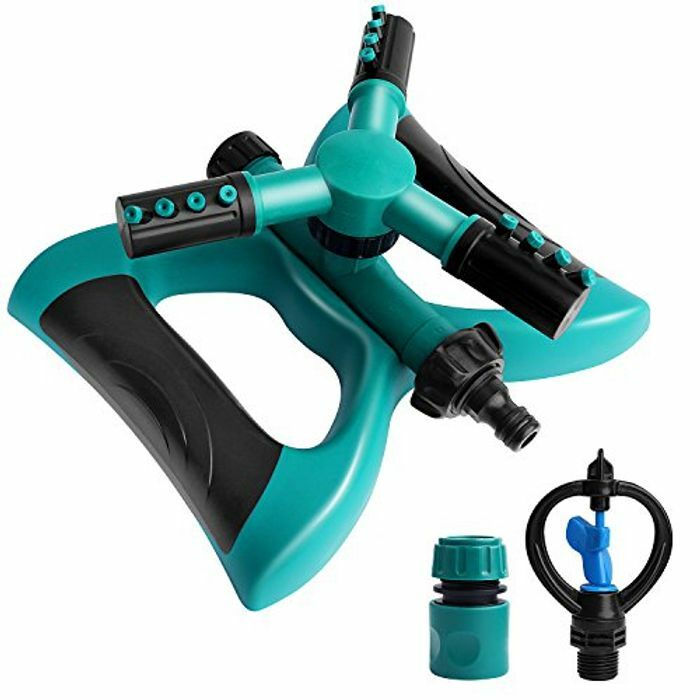 PACKAGE INCLUDES- 1*Plastic large trigeminal garden sprinkler, 1*Plastic base, 1* Leakproof hose connector, 1*Butterfly rotary sprinkler head. HIGH QUALITY MATERIAL- Made from high quality advanced ABS plastic and rust proof polymer. Without harmful chemistry, safe for use and storage. GREAT COVERAGE- Three 360-degree rotating arms with 12 built-in spraying nozzles, covers up to 3,600 square meter. Spray distance up to 32.8' feet for maximum water exposure(water pressure 80 PSI). Multi- SPRAY PATTERNS- Three propeller-type water jets, can adjust the water angle according to the irrigation area. Two different spraying angles: slower 90°rotating with a 4-6m spray diameter and faster 45°with 8-10m treatment.